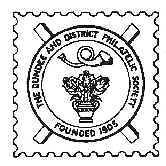 Dundee and District Philatelic Society is the second oldest philatelic society in Scotland and is the only one to have kept its original name for 100 years and to have had continuous meetings. During war time they were regarded as a 'useful tonic'. The society was founded in 1905, in response to a small advertisement in a local Dundee newspaper inviting "any who were interested in philately to attend a meeting" in a (then well-known) restaurant in the Murraygate (possibly where M&S are now situated). In response to this invitation thirteen men put in an appearance and decided to form a society. The first president of this society was Mr Fred David, and Mr George Whitaker, who is given the credit of forming the Society, was elected as secretary and Exchange Superintendent. The subscription at that time was set at 1/6d (7½p in todays money) for adults and 1/- (5p) for juniors under 18 years of age. Dundee and District Philatelic Society was instumental in setting up the first Joint meeting of the Scottish Philatelic Societies - a forerunner to the Annual ASPS Congress. The first meeting which took place in the Dundee Arts Rooms was on Saturday 28 February 1925 as a result of the efforts of Dr A.E. Kidd, who was president of the society from 1921 to 1938. As numbers of members increased, the Annual Meeting in 1928 was moved to Perth which is the venue for the present day Annual meeting of ASPS. Dr Kidd's interests lay in the stamps of the Balkans and his displays were well received by Scottish philatelic societies. he was also well known for his 14 volumes of 'Forgeries, Fakes and Frauds', and he was the first name entered in the Book of Scottish Philatelists. Another well known philatelist, C.W. Meredith, became a member in 1921 and was an active and prominent member of the Dundee Society until 1967. He was President of the Dundee Society from 1939 to 1942 and from 1951 to 1952. He initially specialised in the Chalon Heads of New Zealand but his main interest was the line-engraved stamps of Great Britain. He carried out a huge plating study of the 1841 to 1864 one penny, and was a founder member of the Society of Postal Historians. Mr John W. Christie joined the Dundee Society a few weeks after its formation in 1905 and became 'interim' secretary in 1909, a post he held for the next 25 years. He was involved in organising the 5th (GB) Philatelic Congress held in Edinburgh in 1913 and later in organising the 1923 and subsequent "Joint Meetings". Mr Christie was the permanent secretary for the "Perth Meeting" from the inception of the Joint meetings - a post he held for 10 years. He was an early "thematic" collector of stamps showing Greek Gods , goddesses and Hellenic mythology. For a number of years the Society has produced commemorative covers associated with Dundee and its centenary cover commemorates the 700th anniversary of the death of Sir William Wallace. The cover insert gives details of his Dundee connection. The special postmark is sponsored by Winters Pioneer Ltd, a printing firm in Dundee whose history dates back to James Chalmers' printing works. In 1988 a special presentation was held in Dundee to mark the 150th Anniversary of the postmark, invented by James Chalmers. The image above provides the news item as published in the press at the time. In 2005 our President at that time (Rev. 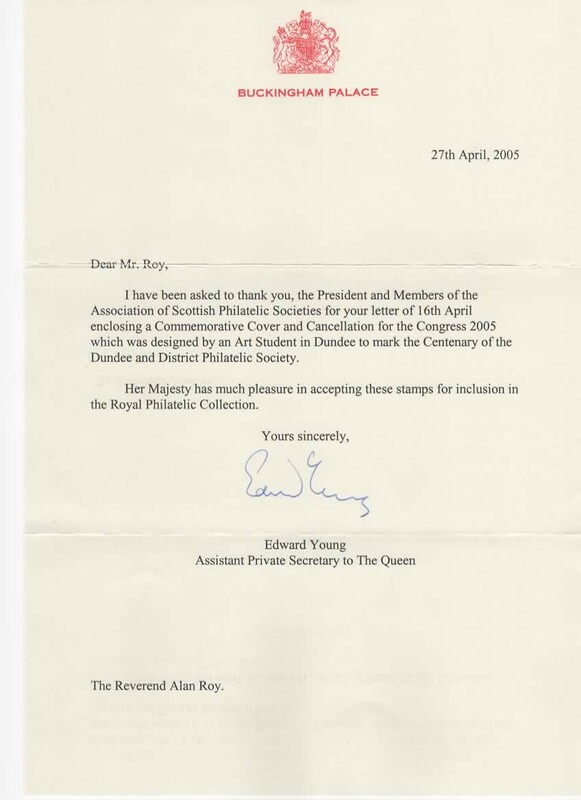 Alan Roy) submitted a copy of our centenary cover to Buckingham Palace for inclusion in the Royal Philatelic Collection. Below is a letter received from Buckingham Palace accepting this gift. Dundee and District Philatelic Society is proud of the contributions that its members have made to philately during its first 100 years and looks forward to its next 100 years. To join us in this adventure in our second century contact the Secretary using the contacts page of the website. This page was last modified on 26th August 2018.